Referendum seen as "a positive step forward for the rights of pregnant people"
Galway pro-choice groups and politicians have welcomed the Government's decision to proceed with a referendum - possibly to take place in late May - to repeal the highly controversial Eighth Amendment to the Constitution. The Government aims to introduce legislation in accordance with the report of the Joint Oireachtas Committee, allowing for abortion on request up to 12 weeks. 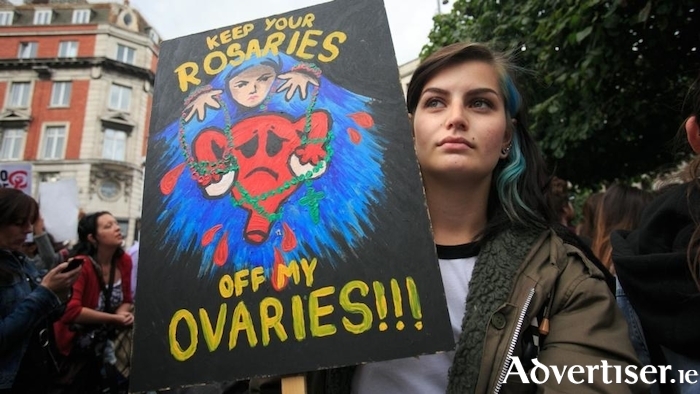 After 12 weeks, as An Taoiseach Leo Varadkar said on Monday, abortion would be allowed only “in exceptional circumstances” where there was a serious risk to the life or health of the woman or where there was a fatal foetal abnormality. Once the Bill is introduced to the Dáil, the Government will establish a Referendum Commission to oversee the campaign. There has been a broad welcome for the referendum among Galway pro-choice groups. The Galway Coalition to Repeal the Eighth Amendment, a newly founded coalition, representing more than 20 organisation in Galway city and county, said the Government's confirmation of a referendum in late May "is the progress our country deserves”. Speaking on the behalf of the group, Sharon Nolan said: “We completely agree with the Taoiseach’s sentiment that we cannot continue to export our problems and import our solutions. Nothing can change regarding abortion access and maternity care without the Eighth Amendment being removed from the Constitution. It is a must for the State to achieve." There was further welcome for the referendum from the Social Democrats. The party's Galway West candidate Niall Ó Tuathail said, “I look forward to working with people of all parties and none in the campaign to repeal and provide healthcare that has been denied to so many Irish people since 1983." meanwhile, the Green's Galway West candidate Pauline O'Reilly, said: "Many women in Ireland have been faced with the difficult decision to end their pregnancies. It is time that we show compassion as a nation and provide women with legal and medical protection in their own country. Citizens now have a choice in the form of a referendum and that is very good news." The Galway Coalition to Repeal the Eighth Amendment will be officially launched in the Harbour Hotel at 7.30pm on Wednesday February 7. Speakers will include Jenni Owen-Thomas (Parents for Choice ), Ailbhe Smyth (National Coalition ), Philomena Canning (Midwives for Choice ), with more to be confirmed. According to Sharon Nolan, "pro-choice individuals, those who want to support, those who want to see the Eighth removed, and representatives of both member or prospective organisations are invited”.